Day Services aims to improve the quality of life for people age 17 years or older living with a life limiting condition by offering therapeutic care and a range of activities to support you and your family, carers or friends. We will tailor your day to meet your individual needs focusing on how you are coping and helping to ease some of the physical and emotional difficulties you may be experiencing as a result of your illness. You will have the opportunity to make new friendships, be given support to manage your condition and maintain your independence. Day services is the coordination hub for all Hospice outpatient services including medical outpatients, complementary therapy, psychological support and rehabilitation. It also offers a drop in clinic operating on a Wednesday afternoon between midday and 3.30pm providing advice, information and support, and a peer support group weekly on a Friday between 2.30pm and 4.00pm; a social group for anybody diagnosed with a life limiting illness their family, friend or carer. How can I access Day Services? Referrals will be accepted from any healthcare professional patient, relative or carer. When referrals are received contact may be made with relevant health care professionals to obtain clinical information. Please complete the referral form above and post or fax to the address/number shown at the top of the form. Alternatively, you can Email the completed form to: referrals@pendleside.org.uk. For an urgent referral 'out of hours', or at weekend, please phone 01282 440101. We will review your plan of care periodically, at which point you may be discharged or a new plan of care agreed. Where possible we ask you to arrange your own transport; however Hospice transport can be provided. We have purpose-built minibuses, which are equipped to transport wheelchair users, people with mobility problems and those on oxygen. An assessment may be necessary for this. A freshly prepared three-course lunch, cooked on the premises, is provided for those present over lunch time. If you have a small appetite, homemade soup and sandwiches are available. Provision is made for anyone with special or cultural dietary requirements. Your medical care remains the responsibility of your own GP. The medical team of doctors at Pendleside may be available at some point during your visit to discuss matters relating to your illness. If you require urgent medical attention, you may be taken to the nearest Accident and Emergency Unit. 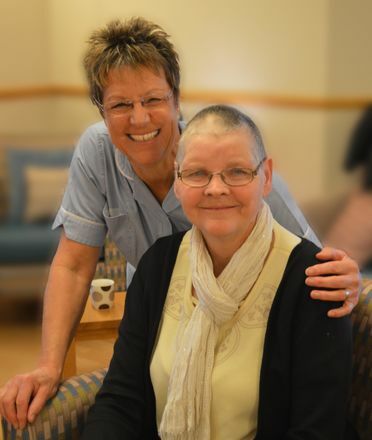 The day service team is made up of specialist doctors, registered nurses, healthcare assistants, members of the rehabilitation team and volunteers, supported by the spiritual care, family support, complementary therapy, catering and domestic teams. How do I contact Day Services? Pendleside operates a no-smoking policy. However, a smokers’ lounge is provided for patient-only use and a smoking shelter is available in the Hospice grounds. If you want to know more about Day Services, please telephone 01282 440110.